When President Trump created the “Presidential Advisory Commission on Election Integrity” last spring — and put notorious vote suppressor Kris Kobach at the helm — voting rights advocates had decades of good reasons to be concerned. The panel seemed destined to back harsh restrictions on voting rights. The fraught commission was recently disbanded. But while that provides a momentary sigh of relief, it doesn’t mean that this Trump-Kobach crusade — or voter suppression — has gone away. For one, there’s still a lot we don’t know about what information the commission collected and what the administration intends to do with it now. Early reports are troubling. For instance, we now know the commission asked Texas to turn over a list of its voters with Hispanic last names flagged. The threat of officials using this data to fuel large-scale voter roll purges looms large. Disturbingly, both Kobach and Trump have said that the Department of Homeland Security will now take up their cause. While Homeland Security counters that its priority is election infrastructure, not voter fraud, the agency also says that it’s working with a handful of states to compare voter data with citizenship data. In addition, the Department of Justice (whose leader, Jeff Sessions, is a notorious voting rights foe) made a sweeping voter data request around the same time that the commission was getting going. Even without a formal voting commission, the threat of eligible voters who’ve done nothing wrong having their rights restricted is still very real. Twenty states are considering bills this year that would restrict the ability to vote. This includes Kobach’s home state of Kansas as well as New Hampshire, where they’re trying — and not for the first time — to make voting harder for students and anyone else who moves a lot. 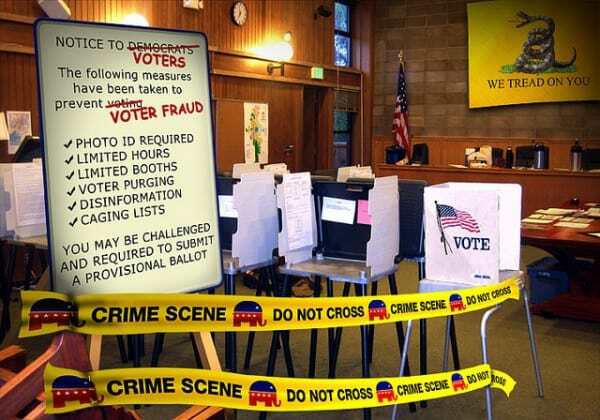 We’re also seeing attempts across the country to enact voter ID laws, restrict early and absentee voting, and to aggressively purge voters who skip just one election cycle, a practice currently being challenged at the Supreme Court. Congress is complicit through its lack of action on voting rights, having gone nearly five years without mending the gaping hole the Supreme Court ripped into the Voting Rights Act. Since 1965, this crown jewel of the civil rights movement has provided important tools to address voting discrimination against racial minorities and others. It’s still very much needed. But thanks to the Supreme Court, the federal law no longer has the teeth to stop bad state laws before they get started — when it makes the most difference to voters. As Trump and Kobach and their far-right allies continue to dismantle democracy at the federal, state, and local levels, those who champion voting rights have a big task ahead of them. But there are signs of hope on the horizon. Perhaps the brightest light shines in Florida, where voters this November will be asked through a ballot measure to give a second chance to fellow Floridians who’ve done their time and paid their debt to society — but who currently can’t vote because of a past felony conviction. If successful, this measure would restore the ability to vote to 1.5 million Floridians. Trump lost his commission, but he isn’t giving up on voter suppression. And that means we can’t give up on fighting for a democracy where everyone can cast a vote that counts.